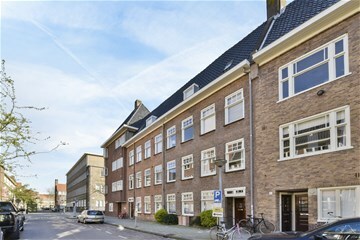 Dintelstraat 33 I Amsterdam - Ramon Mossel Makelaardij o.g. B.V. 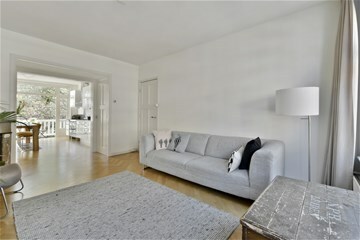 Apartment with a tasteful design and a perfect layout covering 72 m2, plus 2 spacious bedrooms and a sunny balcony. The home has been completely renovated and offers every comfort. Thanks to the typical 1930s characteristics, it is a very stylish property. 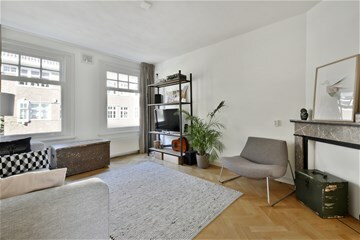 The apartment has a modern, well-appointed kitchen, a spacious living room with sliding doors, a stylish modern bathroom, and a beautiful herringbone floor. An added benefit is that the ground rent has been paid until 2054. 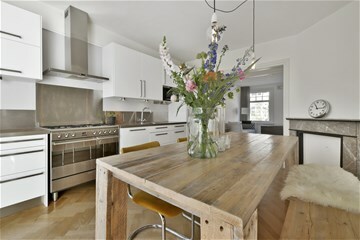 The apartment is located in a peaceful area just off Maasstraat, in the most beautiful part of the Rivierenbuurt area. 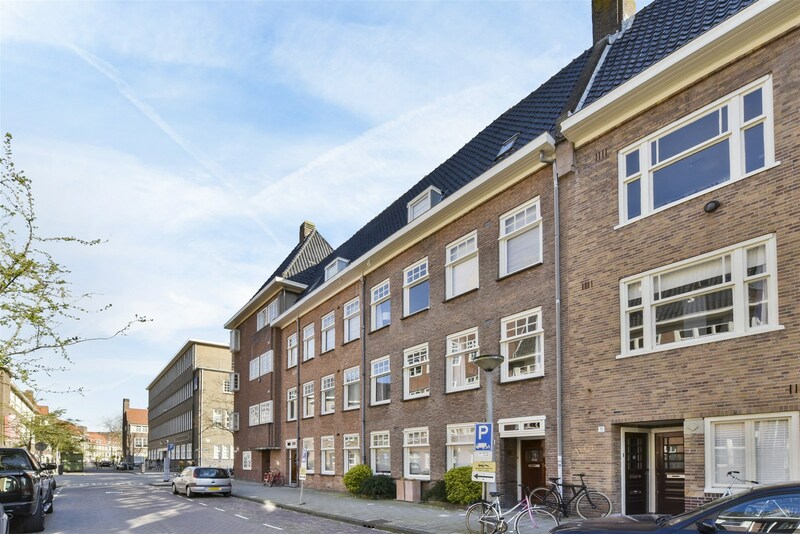 Here you will find a great variety of charming shops, specialist stores, as well as excellent schools and lovely bars and restaurants such as Bar Maas and Tap Zuid. It takes just five minutes to cycle to the bustling area of the Pijp, while the Zuidas business district and Schiphol Airport are also within easy reach. There are various tram, bus and metro stops (including the North-South line) nearby and the RAI train station is also within walking distance. The location is readily accessible by car, with both the A10 and A2 motorways within easy reach and parking spots available right outside your door. There is currently no waiting list for a parking permit. A foyer with handy recess for a coat rack. A spacious living room with sliding doors and original stone hearth and a tasteful open kitchen to the rear. 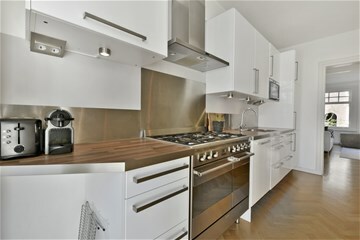 A kitchen in high-gloss white equipped with a variety of fitted appliances such as a refrigerator, freezer, five-burner gas hob from SMEG with two ovens, microwave and a dishwasher. From the kitchen, the French doors give access to the balcony that faces east. Here you can enjoy an unobstructed view of the green courtyard gardens. The first, generous bedroom is located to the front of the apartment and has two built-in wardrobes. Located in the middle of the apartment is a modern bathroom with a bathtub with shower screen, a wash basin unit and a toilet. The washing machine and tumble dryer are neatly tucked away in a recess. The apartment has a separate storage unit for the central heating boiler. To the rear is the second bedroom which is also spacious and provides access to the balcony. 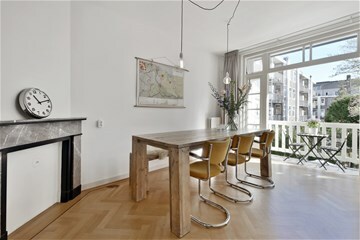 Much of the apartment features a stunning herringbone floor in addition to expertly plastered walls and ceilings. - The ground rent has been bought out until 15 December 2054. - The general provisions for continuous ground lease of 1994 apply. - The living area is 74 m2 excluding the 4 m2 balcony. (In accordance with NEN 2580, measurement report available). - The active home owners’ association has three members and manages its own affairs. - The monthly service fees amount to €100. - All the woodwork on the front and back of the building was painted in 2018. - HR boiler Remeha (2004).